Pre-production models of action figures, often used in early promotion of toy lines, can be both fascinating and funny. 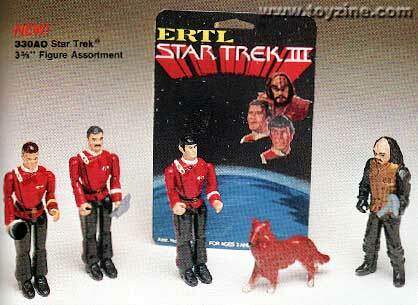 Take this great shot of ERTL’s proposed Star Trek III offering…if you’re a fan, you’ll recall actor Christopher Lloyd’s sardonic portrayal of Kirk’s Klingon nemesis, and perhaps also remember his nasty, vicious reptilian pet. So, you may ask, what’s with Lassie? When the prototype ain’t ready for the camera, just grab the nearest thing…in this case, the PVC collie from their then current ‘Wrangler’ figure line. 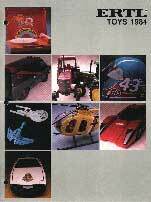 [ERTL Company retailer catalogue, 1984.